Just as everyone has a story, we also all have a past that includes the occasional misdeed. Whether by choice or circumstance, some of us have endured more challenges than our neighbors. Our adventures in puppy raising will bring us a handful of doggy behavior to work with. Our pup may react to a sudden noise (grocery carts banging together) by jumping aside. But we're told by the CCI trainers, it's not so much the reaction as the recovery. If the pup is startled, but can collect himself and continue on with his handler, we consider that a good recovery. The dog has a strong character. It's not so simple with us though, is it? We can easily take some wrong turns in life. But, you know, it's how we handle adversity that reveals our true character. Redemption is our recovery. Yaxley and I are in the grand ballroom at the Sheraton for the first morning of BlogPaws '11. We're introduced to keynote speakers Joe Panz and Big Ant. These two fellas are founding members of the Long Island-based animal advocate group Rescue Ink. Impressive, well-spoken, seriously tattooed and maybe just a little bit intimidating. They have presence, as we say. As they talk and share stories of their work, we relax knowing that we're all in agreement of the same goal here: educating people to save animals from abuse and neglect. Rescue Ink exists to protect those who can't protect themselves. These guys are willing to go into situations considered too risky for animal welfare employees. Joe Panz says they will conduct an animal rescue by any means necessary, keeping within the limits of the law (his lawyer makes him say that, he says). But why? These otherwise tough guys with their own pasts of misdeeds are working towards their own redemption by being there for those who need them. These are good-hearted men who are visceral in their love of animals. They tell us about helping folk find the resources needed so they can keep their pets. And we heard a story about how they educated a fellow who was throwing cats off a building by instilling a new and profound fear of heights into the guy. But do I really agree with their means to an end? Yeah, I dunno. I'm still working that through my head. I'm not a city girl; I know I haven't seen the depths of how cruel people can be to the helpless. No argument then, that we need tough men and women like the Rescue Ink crew to be our voices. Thanks, guys, for doing what many of us just simply don't have the intestinal fortitude to do. There's just no excuse for animal cruelty. 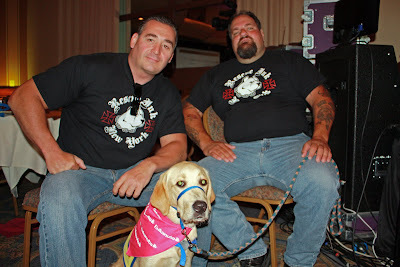 Joe Panz and Big Ant of Rescue Ink. It's OK, Yaxley honey. They're on our side. Yaxley kinda has that "mommy?" look on his face with Big Ant holding his leash. After this shot, the two of them scooped him up and ruffled his ears. I had expected this to be the usual celebrity photo opp, with "OK, Next! ", but these guys just loved all over the yellow dog like they had all morning. Nice. Next blog post: Lunch! Well, more than that. We were invited to a Pawty!